OTTAWA — The Canadian government on Tuesday said it would buy an oil pipeline to the country’s west coast, ensuring that its widely protested expansion will go forward. The Trans Mountain pipeline, which carries oil from Alberta to a port in a suburb of Vancouver, British Columbia, has become a flashpoint in a wider debate in Canada over the environmental impact of tapping Alberta’s oil sands. Critics view the sands as a particularly dirty energy source. Similar objections drove efforts to block the Keystone XL pipeline from Alberta to the United States. Environmentalists and some indigenous groups have strongly opposed the expansion of the pipeline, citing environmental concerns. The province of British Columbia is trying to block it in the courts. But the oil industry and the Alberta government argue that the expansion would bring needed jobs and help the economy. The purchase of the pipeline, for 4.5 billion Canadian dollars, puts the government squarely on the side of the oil industry. Since taking office in 2015, Prime Minister Justin Trudeau has introduced several measures to mitigate climate change, including introducing a nationwide carbon pricing plan. But he also contends that Canada’s economic well-being depends on its having a vibrant energy industry. The decision to buy the pipeline from its American owner, Kinder Morgan, may become the biggest test of Mr. Trudeau’s assertion that his government is balancing the needs of the energy industry with environmental concerns like climate change. It is likely to sour Mr. Trudeau’s relations with environmental groups. Aurore Fauret, a campaign coordinator for the environmental group 350.org, said Mr. Trudeau “has moved from being a climate leader to a pipeline cheerleader.” She vowed that protests would continue. Over the past few years the pipeline has prompted large protests in British Columbia, and dozens of people have been arrested for breaking a court order limiting demonstrations near Kinder Morgan’s tanker terminal in Burnaby, British Columbia. The efforts echo the protracted and large protests against Keystone XL, a pipeline also linking the Alberta oil sands to the United States, at the Standing Rock Sioux Reservation in North Dakota. John Horgan, the premier of British Columbia, said the province would not back down from its court action challenging the federal government’s exclusive jurisdiction. The expansion will put a second pipeline alongside about 610 miles of the 715-mile Trans Mountain pipeline, which opened in 1953. It will increase the system’s capacity to 890,000 barrels a day, from 300,000, at a cost of $ 7.4 billion. Most of the oil sent through the Trans Mountain pipeline heads to the United States either through a spur pipeline or aboard tankers. Supporters of the expansion argue that it will open Asia as a second market for Canadian oil. The Trans Mountain plan could be the energy industry’s last stand in Canada. A previous plan to link the oil sands with the coast of British Columbia was abandoned, as was a proposed pipeline to eastern Canada. The pipeline plan has also started an unusually acrimonious war of words, litigation and legislation between British Columbia and Alberta, which relies on the energy industry for high-paying jobs and billions of dollars in resource royalty payments. Mr. Horgan’s opposition to the pipeline appears rooted, at least partly, in political calculations in British Columbia. His government needs the support of three lawmakers from British Columbia’s Green Party to stay in power. They all adamantly oppose the pipeline. British Columbia’s opposition led Kinder Morgan to suspend nonessential spending on Trans Mountain last month. The company also said it would give up on the expansion if British Columbia did not stop its efforts to halt the plan by this Thursday. Rachel Notley, the premier of Alberta, has fired back at Mr. Horgan. She briefly stopped wine imports from British Columbia and this month signed a law allowing her government to suspend oil and gas supplies to its neighbor, a move British Columbia is also contesting in court. On Tuesday, Ms. Notley appeared to take credit for the action by Mr. Trudeau’s government. Mr. Morneau, the federal finance minister, said the government would eventually sell the pipeline, in its expanded form, back to the private sector. The government has suggested that it might even turn a profit. 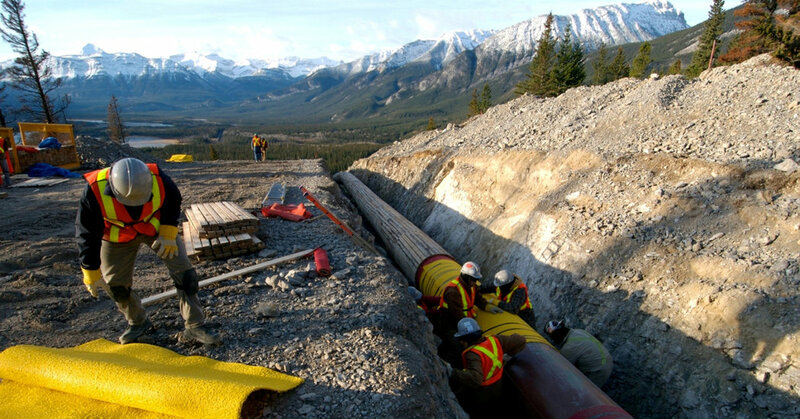 Polls indicate that Canadians over all are split about the pipeline and the expansion plan. Mr. Trudeau’s Liberals currently enjoy considerable support in the Vancouver area, but his party has long been unpopular in Alberta — a bastion of conservative politics in Canada, Ms. Notley’s left-of-center government notwithstanding. Keith D. Brownsey, a professor of political science at Mount Royal University in Calgary, Alberta, said he expected the Liberals might lose seats in British Columbia in next year’s election because of the Trans Mountain deal. But he said the decision to buy the pipeline will benefit the party on the whole, particularly when combined with its climate remediation steps and its strengthening of environmental oversight of proposed energy projects. Because of an editing error, an earlier version of this article incorrectly suggested that most Canadian oil is sent to the United States by ship. Generally speaking, only oil sent through the Trans Mountain pipeline is sent by ship to the United States. Follow Ian Austen on Twitter: @ianrausten.